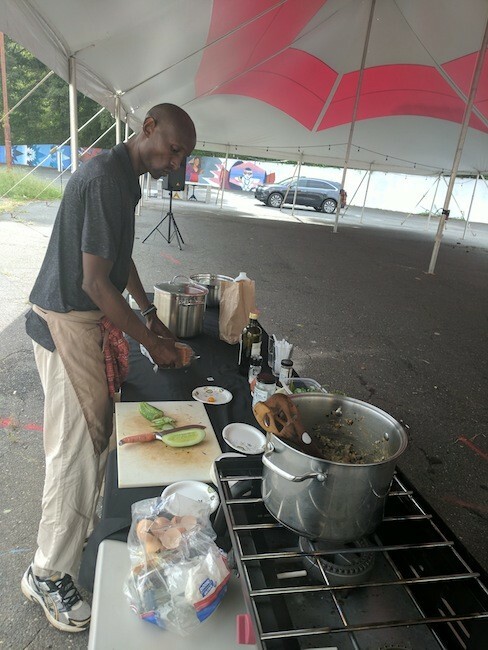 On a recent Saturday morning, during the first farmer's market hosted solely by Johnson C. Smith University's Sustainability Village program, chef Njathi Kabui went to work on a breakfast dish as he explained his cooking process to anyone who wanted to listen. He began with an eggplant that he brought from his own garden. He sautéed the eggplant in a pot then began adding ingredients: diced tomatoes, onions, rosemary, basil, parsley, coriander, a small amount of peach, a few cracked eggs and a bit of ngaingai, a Congolese plant with a citrusy taste. As he finished, he began scooping out the green and yellow grub and placing it on slices of seven-grain bread, then topping each one with a thin slice of cucumber before serving them to anyone in attendance, free of charge. His most important ingredient, however, was one that no one saw him toss in the pot: social justice. "I call it Afrofuturistic conscious cuisine," he told me when I asked how he describes his food. "It's cuisine that is steeped in the South and the struggle for justice and the influence of African food in the South. I understand food to be one of the most political things you ever touch in your life. People cannot be politically free if they don't have control of their food." And in that statement, Chef Kabui wrapped up the driving force behind a movement that has become stronger in Charlotte over the last two years; a movement to not only confront the food access gap in some of Charlotte's most underserved communities, but to tackle it head-on. 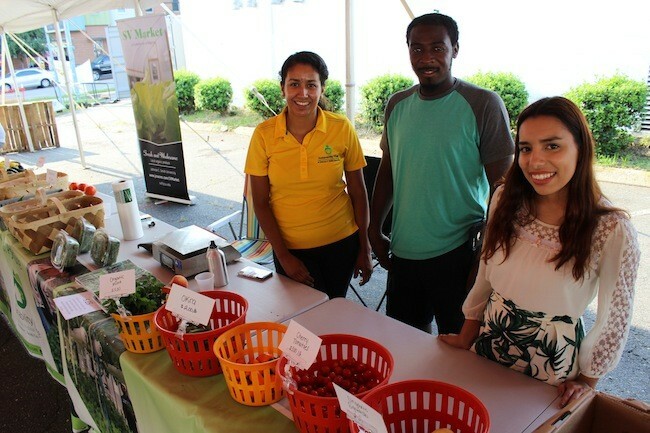 Organizations like the Sustainability Village, The Bulb and Rosa Parks Farmers Market in west Charlotte have been working — often together — to bring farm fresh foods to communities that have not historically had access to it. The expression most folks use is a food desert, but Kabui calls that a loaded term. "To say that there's a food desert, OK, food doesn't grow in the desert, but why do we use that word in actuality?" he asked. "The reason why we use that word is to make the crime of denying a people power less cynical or less biting. The reason why there are no foods in certain parts of the United States — one of the richest countries on the planet — is because people decide that those people should be powerless." 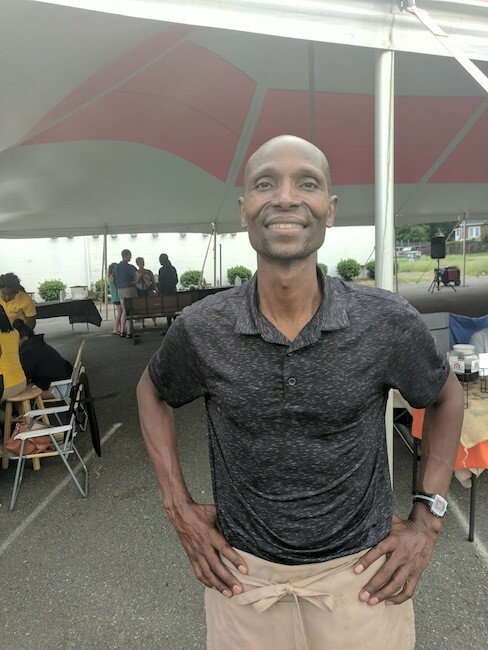 And that's why Kabui, who has traveled the country teaching cooking demonstrations and giving speeches about food and its ties to social justice, has been happy to partner with the Sustainability Village and the Rosa Parks Farmers Market for the last three summers. To be food insecure means to not have reliable access to affordable, nutritious food. Mecklenburg County's food insecurity rate is 16.4 percent, according to a report recently released by an independent consulting firm hired by the county. That percentage, which is higher than the national average of 13.4 percent, means that 173,000 Mecklenburg residents are food insecure. 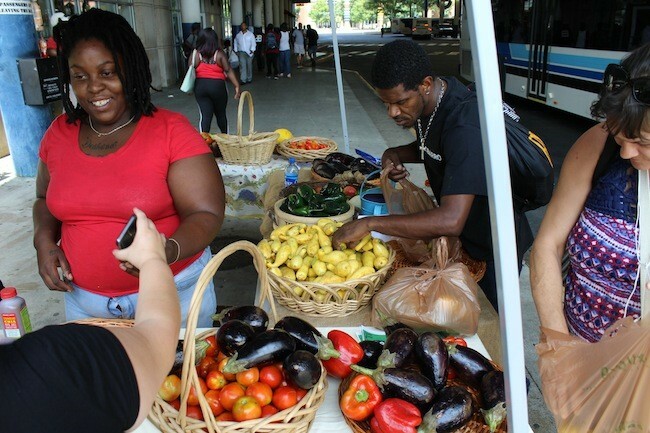 Opened in June 2016 as a partnership between the Mecklenburg County Health Department and Johnson C. Smith and the Historic West End Partners, the Rosa Parks Farmers Market aims to bring that number down in the Beatties Ford corridor. 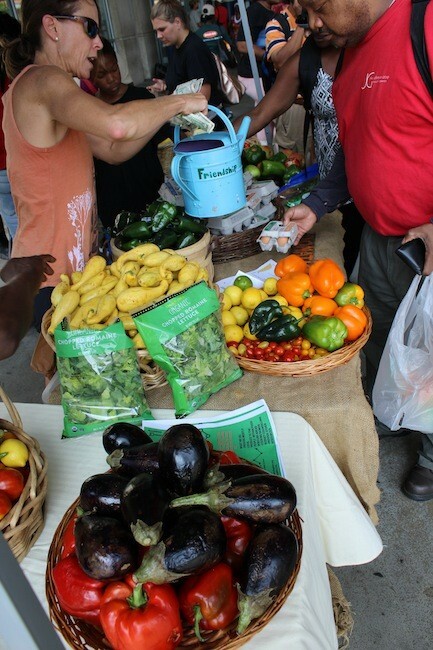 More than a year before opening, the county formed the Rosa Parks Farmers Market Community Advisory Council (RPCAC), made up of community members in an effort to find what residents would like to see in a local farmers market. "We build things and then we expect people to come," said Elliot Royal, food access coordinator with the county's health department. "But we wanted to build what that area was interested in." Some of the key points coming from community members included the desire to see people of color working the market. They also wanted the market to accept EBT cards, allowing them to use their Supplemental Nutrition Assistance Program (SNAP) benefits. Organizers at the Rosa Parks Farmers Market have addressed both of these needs. As for SNAP, organizers were happy to oblige. Not only that, they encouraged it. Royal said that Rosa Parks Farmers Market is the only farmers market in Charlotte that offers "Double Bucks," meaning that customers can redeem up to $20 worth of SNAP benefits and buy double that amount worth of fruits and vegetables. "In a month, we're able to enhance a family's nutrition intake by $80 [worth of food]," Royal said. As for the other feedback heard by Rosa Parks market organizers, much of the food being offered at the market comes not only from people of color, but from students learning their trade right next door. 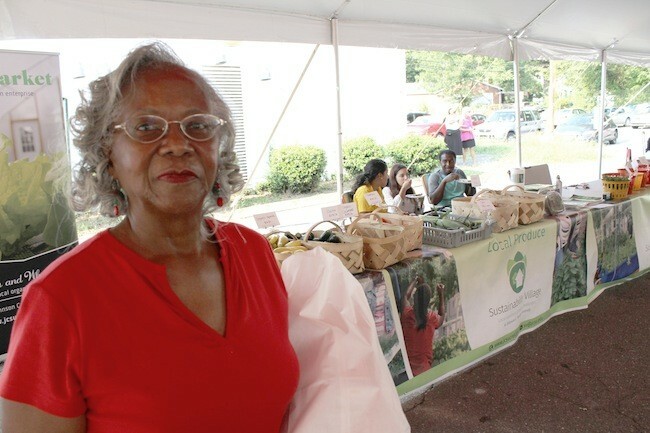 Johnson C. Smith's Sustainability Village is a program that was launched in 2013 and played a big role in helping the Rosa Parks Farmers Market get its start. The initiative was launched to address food access issues in the city's northwest corridor. The program makes use of raised beds, aquaponics and hydroponic systems housed right on campus to help educate students and provide community members with accessible, healthy food. 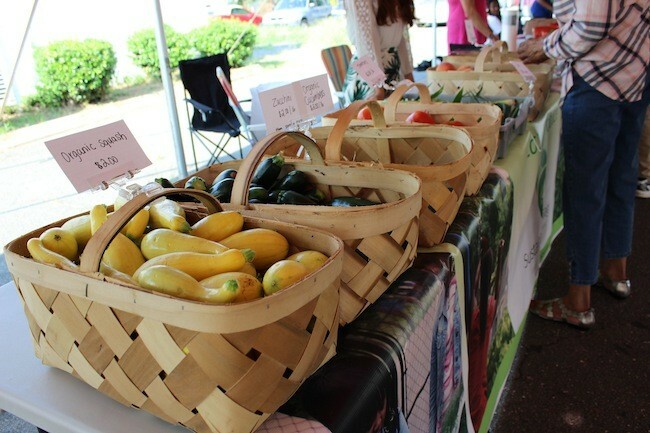 During a recent Rosa Parks Farmers Market, which is held every Tuesday from 3 to 7 p.m., a group of students sat behind baskets of organic squash, zucchini, cucumbers, corn, peaches, tomatoes, okra, mint and more that had been grown on campus just a block away. Brenda Montanez, a biology major working with Sustainability Village, said the selection was based on community feedback, rather than trying to tell folks what they should be eating. Students with the organization have carried out community surveys by going door-to-door and are constantly seeking feedback from people who attend the market. 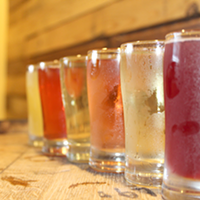 "We try to have as much as they will potentially use, so we grow products that they want rather than the ones that we think they would like," Montanez said. Another bit of feedback Sustainability Village organizers heard was that residents have a hard time reaching the Rosa Parks market on Tuesday afternoon, according to Dr. Philip Otienoburu, director at Johnson C. Smith's Center for Renewable Energy and Sustainability. "It's still a big barrier for people to access the market," Otienoburu said. "Most people tell us that they'd prefer to have a Saturday market, because that aligns with their shopping schedule and is the time when they have free time available from work." He said that Saturday's Sustainability Village market was just a pilot program, and he plans to hold two more — one every other Saturday — to test whether enough people will come to make it worthwhile to bring on more vendors beside just the Sustainability Village students. The first Saturday market drew about a dozen customers in the first couple of hours when Creative Loafing was there. The next one will be held on September 1 at 8 a.m. Though it may take time for residents to catch on to the Saturday markets, Sustainability Village will be moving full steam ahead. On Wednesday, August 22, Otienoburu and the rest of the Sustainability Village crew broke ground on the construction of three new greenhouses that are expected to quadruple food production on the campus, providing year-round nourishment for underserved communities on the west side. The expansion comes thanks to a $325,000 investment from Blue Cross Blue Shield. Vivian Stuart, interim chair of the RPCAC, hopes the market can not only serve food but also help turn around a struggling piece of land. 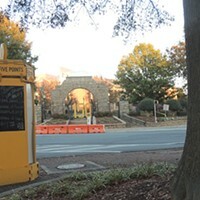 This summer, the market moved from the Mecklenburg County Health Department on Beatties Ford Road to a parking lot on West Trade Street. Across the street, the Mosaic Village flourishes, but the old A&P Grocery still stands boarded up and abandoned in the lot where the farmers market now operates. 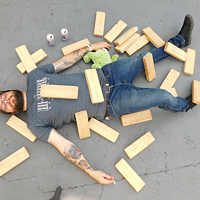 Last year, there were reports of a restaurant incubator opening in the building, but nothing has come of it. "It's a wonderful feeling for us, because they talk about the so-called food desert, and this is bringing fresh, affordable food to the community," Stuart said during a recent market. "I can see it's going to rejuvenate this area. 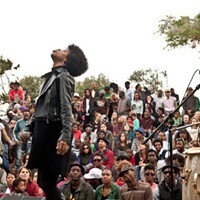 And that building, one day we expect it to open, and that will be also an advantage to the community." With all the fresh food coming into the community, folks need to know what to do with it. Upon the launch of the Rosa Parks Farmers Market in 2016, Otienoburu recruited Chef Kabui to hold cooking demonstrations there so community members could learn ways to take advantage of the new foods available to them. 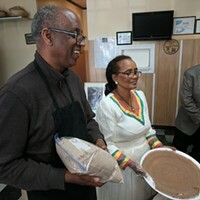 "One thing that we wanted to do was, one, increase food access in the corridor, but also create the local capacity for not only growing food but also preparing food at home," he said. "Because the culture of cooking is eroding in the community, and we can't just present a farmers market to the neighborhoods around here without guiding them on how to prepare their foods. These two things go hand in hand." The idea has been a hit, as Kabui has built a following of regulars who attend the Tuesday markets just to learn new tricks from him. "It's a very, very special opportunity for me and it's something that's very dear across my heart," Kabui said. "To look at people who are from underserved communities who are really beginning to understand food in a very complex way is very interesting to me; to see how people can begin to make very fundamental changes where they understand exactly the big implications of food." The big implications of food are not lost on Alisha Pruett. As a social worker who moved to Charlotte from New York City in 2012, Pruett worked to find housing for homeless veterans. She quickly recognized the issues surrounding food accessibility in certain communities around the city. "I would house [clients] and I would realize they were away from food access or food resources and even referring them to food pantries was a haul for them," Pruett said. Furthermore, when she would go to the food pantries herself to pick up food for her clients, she realized that all of the food was processed. "Even though that was a great resource, it was just not healthy food for the people I was serving. Diabetes was rampant in my caseload," Pruett said. "I didn't feel comfortable with that, so I started going to farmer's markets and gleaning off of what they couldn't sell." 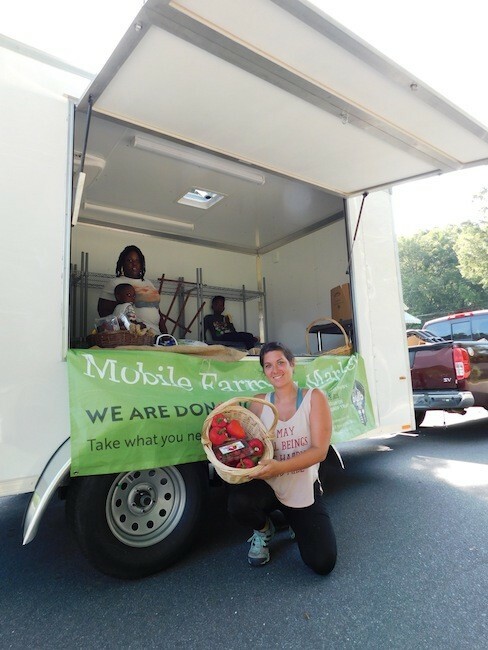 Little did she know that her efforts to feed a family or two with the leftovers from farmers market vendors would turn into The Bulb, an organization she founded that now hands out an average of 800 pounds of fresh food per day to 30 underserved communities in and around Charlotte. Pruett partners with local farmers, local organizations like Friendship Gardens, farmers markets and corporations like Trader Joe's to provide residents in food insecure neighborhoods with healthy food. Since launching in October 2016, The Bulb has provided nearly 10,000 pounds of free, fresh food to the communities that need it the most. On a recent Thursday afternoon, I met Caroline Miller, a volunteer with The Bulb, at the Charlotte Transportation Center for a free market she helps organize there between 3 and 5 p.m. each week. When I arrived, Miller already had a tent and a table set up with piles of fruits and veggies including apples, eggplants, squash, lemons, tomatoes, onions, lettuce, eggs and peppers of all shapes and colors. Some folks knowingly approached and began filling up bags, while it took others some time to realize that the cornucopia of fresh foods in front of them was for the taking. As Miller worked alongside new Bulb employee Trenisha Birtha, the two were sure to meet each and every customer who approached the table, asking their names even while rushing to replace the rapidly diminishing piles of food on the tables. 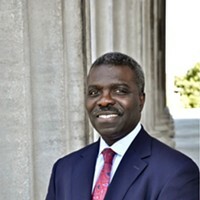 Stephen Hayes, a north Charlotte resident who was at the Transit Center to commute between his day job and night job, filled a bag with zucchini, squash and spring onions that he said he would use for a casserole; eggplant for lasagna; and red peppers that he would find a use for in whatever he cooked, he said. "This means a lot to me," Hayes said. "This saved me 20 bucks. I'm not spending money that I work hard for but I really don't get to see." It's a sentiment that Pruett has seen shared again and again from thankful customers, some of whom don't have the ability to work two jobs like Hayes and are on a very fixed income. "The average people we serve only have $15 in SNAP, and they really are struggling to get food," Pruett said. "The corner store markets or Burger King, they're expensive meal for meal, and a lot of people are saving money and putting their money toward rent. I have seen — especially in the affordable housing units we serve — the eviction rates are going down, because they're saving about $200 a month with us being there weekly." Miller, who used to volunteer for Friendship Gardens but now focuses all of her energy on The Bulb, said she's been blown away by the generosity of customers who attend the Transit Center market. "I've been most amazed at how appreciative people are that we're here for them, how overwhelmed they are that we're actually just giving it to them," Miller said. "And also how much they want to help us. I find now that every time I show up for this market, I have this plethora of people that want to help set up and they ask about how they can get involved and help or volunteer. And these are the people in the community who are so affected by this generosity and what Alisha's created. I think it inspires them to give back as well." In fact, that's how Birtha got involved. She met Pruett through the market and volunteered to help. Then, in late July, The Bulb received a grant from the North End Smart District that will fund The Bulb for four months while it served eight North End neighborhoods on a weekly basis. The grant didn't just help with gas money and other supplies, it also allowed Pruett to make a much-needed expansion, hiring three people from inside the neighborhoods she serves. One of them was Birtha, who now works as an outreach coordinator with the organization. She said her goal is to one day start her own nonprofit, and her new job as put her on that path. "Alisha needed help, and this is something that's perfect for me," Birtha said. "I'm dealing with people that I'm comfortable with. I'm giving back. I can bring my kids. This is just always something that I wanted to do. I feel like it's a blessing because I didn't know where to start, and I got my start." 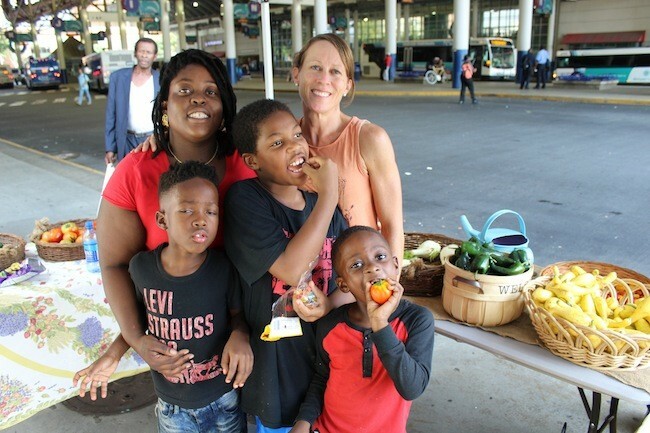 While tents and tables like the one at the Transit Center used to be the norm, Pruett was able to take her market on the road this past June after completing a Feeding Innovation seed-starter program and receiving a grant from the SC Community Loan Fund. The grant made it possible for her to buy a trailer. She's now able to drive around and set up shop much more comfortably in the communities she serves. Quicker set ups and takedowns allow her to hit more spots in a day, as well. Once she arrives at a new location, she said, that's when the magic happens. That was evident on a recent morning in the Druid Hills neighborhood in north Charlotte, when two women got to talking while filling bags with veggies. The women were neighbors but had never met. Soon they were swapping stories and recipes. "When you bring that nourishment to every community, you see people actually feeling better, communing around our truck or tables, and a lot of people start talking about recipes and what they're going to cook this Sunday, like we just heard," Pruett said. "So I do think that it's a lot more than just distributing food, like other programs might. We know everyone's name and we try to initiate a conversation on how we get better as a community." Alisha Pruett prepares her mobile market. Pruett often hosts cooking demonstrations wherever she sets up shop, similar to what Chef Kabui does at the Rosa Parks Farmers Market. Within the next year, she hopes to introduce a new type of community building by hosting art workshops out of the trailer while she's serving food. She wants to allow folks to sell their art out of the trailer, giving them an opportunity to profit as creatives. But in the immediate future, she'll be unveiling a new kind of art, as the Charlotte-based design firm The Plaid Penguin is currently working on a wrap for the new trailer, which is currently a plain white. 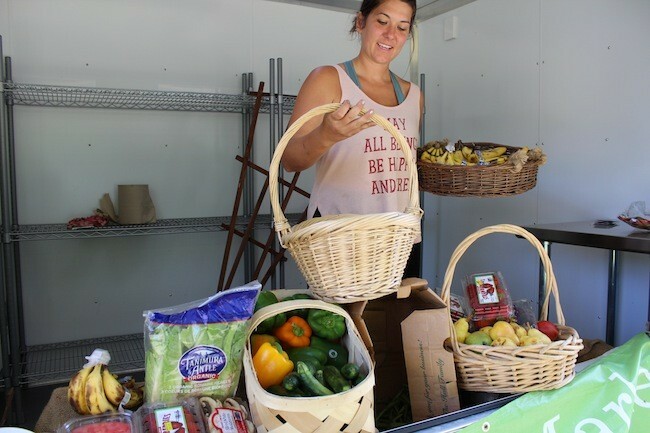 She plans to show off the newly decked-out trailer at the Rosa Parks Farmers Market on Tuesday, August 28. Pruett tries to be a vendor at the market as often as possible. "That market is quintessential," Pruett said when I brought up the Rosa Parks market. "It's not just a market, it's servicing the neighborhood, and seeing all these organizations come together and farmers and cooks and chefs, that's basically an ideal thing for us. That's the pinnacle example. We want to do that on the road." Also at the market that day, you can expect to see Chef Kabui teaching folks how to make great food, all the while tying it in with the one thing he finds most important: empowering communities. Kabui doesn't drive down from his home in Apex on a weekly basis just to throw some things in a pot and call it a day. He — like Stuart, like Pruett, like Royal, like Birtha — has a vision. "The reason why the market is here is because of the very foundational unsustainability of the cultural and business practices that we have in this country, in the South and globally," he said. "We do things without thinking long-term. We do things that are for market reasons, just on the bottom line, 'How much money am I making?' Obviously, now we are thinking slightly different. We have come to the realization that that's not always the smartest thing to do. "As we reinvigorate this market, I hope that the message can be driven home that we have to make very, very fundamental changes, and among those are the way that we eat, the way we think about food and the relationship that we have with food, as a foundation for creating more just and more equitable societies." And it all starts with one corridor.